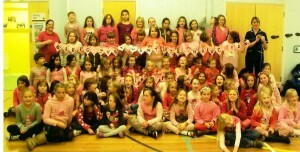 Brownies from the Isle of Wight Osborne Section decided to wear something pink instead of their usual brown uniforms recently all in the aid of charity. Nearly 100 girls met up for an afternoon of fun with craft work, games and singing on the agenda. This event, which was held at Hunnyhill Primary School, Newport was organised by Osborne Section Commissioner Katie Charlton. As well as being a great opportunity for the girls to meet up with other Brownies from different towns on the Island this event raised £150 for the Breast Cancer charity. All the activities were pink themed with the making of pink butterflies, fish and hearts, games with pink balloons and even Jenga using pink wafer biscuits. Tea was enjoyed by all and a cheque presentation to the Breast Cancer charity followed. Following on from the idea of the ‘Turn the Island Pink’ campaign all the Brownies and most of the leaders sported something in pink and most of the girls gained badges for their efforts.